I have so far seen all four of the Ice Age movies in theaters, and Dreamworks [Ed. : Correction, Blue Sky/Fox] seems to be keeping with the tradition in this series that no movie after the first one should have a plot that makes sense. Still, like a good book with a few plot-holes (think Stephen King's Christine), it is better just to not think on whether what sets off the story actually makes sense and just enjoy the story. What I mean by this is the very beginning. The movie starts out, very predictably, with Scrat, the saber-tooth squirrel, snuffling around an icy mountain peak. He's got, also very predictably, an acorn he wishes to cram into the Earth for whatever reason. Unpredictably (unless you've seen the previews) this causes him to break the mountain in half, and fall to the Earth's core. He proceeds to cause a lot of chaos which sets the movement of the tectonic plates in motion with a speed that gives credit to the new-earth theory of some creationists. It really does get better, I promise. Meanwhile, we rejoin our our quirky herd of protagonists. Some time has passed since the end of the second movie, because Peaches (Keke Palmer), the newborn mammoth we saw at the end of Dawn of the Dinosaurs, has grown into a rebellious teenager who no longer thinks boys are cute. (They're hot.) And, like all rebellious teenagers, all she wants is to be cool, but her overbearing father wants to keep her "daddy's little girl". She's also got a friendzoned guy pal to keep her grounded — in this case, a somewhat-spineless molehog named Louis (Josh Gad). Peaches' father, Manny (Ray Romano), catches her sneaking down to "the Falls", where the delinquent ice age mammals hang out to do dangerous stunts and God know what else. He punishes her; she retorts with a typical "I hate you"-esque comment and storms away from the rest of the herd, her mother (Qeueen Latifah) going after her. This is when Scrat's misadventures come in to play, and the Earth tears itself apart along with Manny's mate and daughter. As they drift away before his eyes, Manny promises to find them, "no matter how long it takes". Now, Manny, Sid (John Leguizamo), and Diego (Denis Leary), as well as new character "Granny" (Wanda Sykes), Sid's senile and newly-abandoned grandmother, are drifting across the ocean on a small hunk of permafrost, while Ellie, Peaches, and possums Crash and Eddie must help the other animals and themselves avoid the still-shifting continent's wrath by making it to the "land-bridge" (keeping with the series' penchant for mass migration). As the animals are now forced to keep in close company, Peaches' problems with peer-pressure worsen. She wants so badly to chase after cutehot mammoth boys that she denounces the one true friend she has and the pride she had in her "half-possum" heritage. Even as she must overcome physical obstacles as the world literally crumbles around her, she has a hard lesson to learn in letting people change who she is. Torn apart from half of his herd (and arguably the ones that mean the most to him), Manny is desperate to return to what remains of the continent he last saw them on. The currents have other plans, however, and his only hope is to reach Turn-back Cove and catch a new current. Someone is out to stop them, however: a a motley crew of pirates led by Captain Gutt (Peter Dinklage), a gigantopithecus in serious need of dental floss. One thing I continue to dislike about the Ice Age movies is the comedic relief character, Scrat. It's only getting worse now that they're trying to make him more central to the plot. In this movie, after destroying Pangaea, he spends his time searching for Scratlantis, an acorn haven. He once again meets a foul end. Let's hope he stays dead this time. Computer animation has certainly come a long way since the first Ice Age movie ten years ago. What's furry is furry, what's smooth is smooth, and what's...well, you get the idea. It looks good, and nothing is garish or clashes; the character design fits the character like it should in a kid movie, and eye-positioning is not awkward. The voice-acting was, as always, very good. It is interesting to note that Nicki Minaj played a trashy teenager. Don't laugh too hard; it's genius. I did watch this movie in 3D and my opinion on it is the same as all 3D movies: 3D is the green-screen of this decade; everyone wants to use it, but we really haven't mastered it yet. 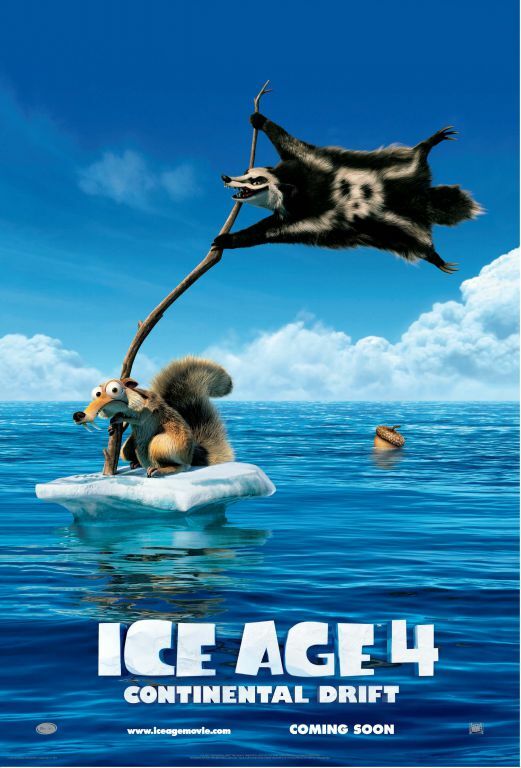 If you can ignore Scrat, Ice Age 4 would be a very good movie combining a few oldie-but-goody sub-plots with charming characters, and even a fun sea-shanty with Jennifer Lopez. "...Dreamworks seems to be keeping with the tradition." If DreamWorks kept with tradition on this film it would not have been done. THEY DIDN'T MAKE THIS FILM!!!! Dreamworks didn't make the Ice Age movies. This makes me a little suspicious; the opening credits of the film clearly don't have the Dreamworks logo, and do clearly identify Blue Sky and 20th Century Fox as the responsible parties. Are you sure you watched this movie? Ice Age is not a DreamWorks Animation franchise. Another great reporting job by stupid amateurs. "Dreamworks ..." It is significant that people no longer think that all "cool" CGI movies (and the Ice Age movies are arguably "frosty") are from Pixar. Now, anything CGI that is not from Pixar must be from DreamWorks. I guess that this means that Jeffrey Katzenberg has successfully established his studio as the major non-Disney/Pixar "producer" (actually distributor; several DreamWorks movies are actually by Aardman Animations or Pacific Data Images) of animated features. Sadly in America we tend to break every thing down into two groups. Pepsi and Coke. Gay and Straight. Democrat and Republican. Good and evil. Then again, not sure if that's an American thing or a human thing. Wow, I do appear to have accredited this movie incorrectly, and regrettably so. I apologize to the the good folks at Fox and Blue Sky, as well as those at Dreamworks for my mistake. I also apologize to the readers for that bit of misinformation in a place where one should trust it to be correct, I should have double-checked it before submitting it (it wouldn't have been hard; I am on the Internet, after all) but I suppose I was too preoccupied with whether or not I was rambling--as I have a tendency to do that. Anyway, I hope I haven't soured any non-regular readers' opinions of the movie reviews on this site as they are not normally written by me. I'm going to pull a Fred here and post a mini review in the comments; the movie was better than I expected, but in an enjoyable-cartoon-movie way, not a engaging-story-Pixar-or-recent-DreamWorks way. It was not boring, which has been a problem with movies all summer; movies have been bad before, but God, what a bunch of bland badness this year has put out. Ice Age 4 is not bland, at least. It kind of flips Ice Age one around; that movie had decent story chops (for the time, anyway, during which Disney couldn't tell a story to save its soul, DreamWorks hadn't figured out that was why the first Shrek worked and Pixar had taken the year off), but is actually pretty hard to watch due to very dated CGI. This movie pretty much jettisons story for beautiful animation. It is a story about very furry (in the "covered in the fur" sense) characters on water, both very hard to animate, and both animated beautifully here. Character design is consistent with older movies (a challenge given what I just said last paragraph), and new characters fit in with old characters. The humor is hit or miss, mostly miss, admittedly, for me, though Sid offhandedly commenting on dinosaurs in the ice age was probably the best joke. Seriously, I have no idea what the hell the is happening in this movie with the plate tectonics or whatever. Not because I don't know about plate tectonics, but because this movie doesn't. There is a natural disaster that is forcing the herd of herbivores to move, but it doesn't have a name because it doesn't exist outside of this movie. That, and I don't think hurricanes work that way either. Or icebergs. Or, you know, anything in this movie. I liked the girl sabretooth. She had a cool character design.